This past week, Hurricane Sandy met up with her blustery friends from the north and the west to pound the east coast of the US. And as cleanup efforts continue an equally terrifying political storm looms on the horizon as we finally get to elections next week. In the midst of all the turmoil, it’s difficult to know exactly where to turn for a blog topic. So what I have decided to do this week is to offer a moment of stress relief during this relative calm between the storms by writing about nothing. Specifically, I want to talk about the invention of the “nothing” that occupies the center of a traditional American doughnut. Though versions of doughnuts have been around for centuries and can be found throughout the world, the round doughnut with a hole in the middle has become largely an American tradition since it was introduced, most likely by the Dutch. This is one piece of history on which no one can really be sure, but one story does stand out as the clear fan favorite. At the age of sixteen, a young Dutchman named Hanson Gregory set out for a life at sea. Like most successful young men, Gregory had a mother who loved him and worried about him, probably would have even struck out into the world with him if she could have, but because a young man needs the space to make his own way she did the next best thing. She cooked up a bunch of his favorite pastries (olykoek or “oily cakes”) and sent them with him. And like great moms everywhere, she also sent along the recipe. Young Gregory gave his mother’s recipe to his cook and set about his ship duties. Life was good. He was doing his own thing, but could still enjoy a taste of home. Then on June 22, 1847, a terrible storm rose up and Gregory, olykoek in hand, had to make a decision. 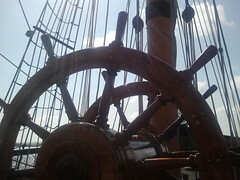 Either he could grab the ship’s wheel with both hands and fight to keep the boat on a safe course, but sacrifice his tasty snack in the process or he could eat his olykoek and possibly sacrifice the ship and the lives of its crew. The clever young man did the only thing there was to do. He took his olykoek and plunked it down one of the wheel spokes to secure it. His pastry now safe, he grabbed the wheel with all his might and saved the ship. The early olykoek was pretty much just a ball of dough fried in pork fat which often cooked unevenly, leaving a gooey center. What Hanson Gregory discovered during that fateful storm was that an olykoek with a hole in the middle, tasted better than the original and so he asked his cook to prepare them that way from then on. 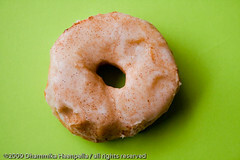 The doughnut as we know it today was born. The doughnut really took off in America, though, when, in 1920, New York businessman Adolph Levitt invented the first doughnut-producing machine. His mass produced, holey, pastries received the label “Hit Food of the Century of Progress” at the 1934 World’s Fair in Chicago. We Americans have loved our doughnuts ever since and the proof is the success of chains such as Dunkin Donuts, launched in 1948 and Krispy Kreme Doughnuts, which got its start in 1936, as well as the rise of smaller doughnut boutiques throughout the nation, where one can often sample the best and strangest the doughnut industry has to offer. On a recent trip to Portland, my sons and I visited one such doughnut shop. Voodoo Doughnuts has been a downtown oddity in Portland, OR (a city known for downtown oddities) since 2003. Though it is possible to order a traditional glazed doughnut, the more than 90 doughnut varieties on the menu also include some truly bizarre options such as the Tangfastic. Sadly I was not brave enough to try that one, but the varieties we tasted were delicious. 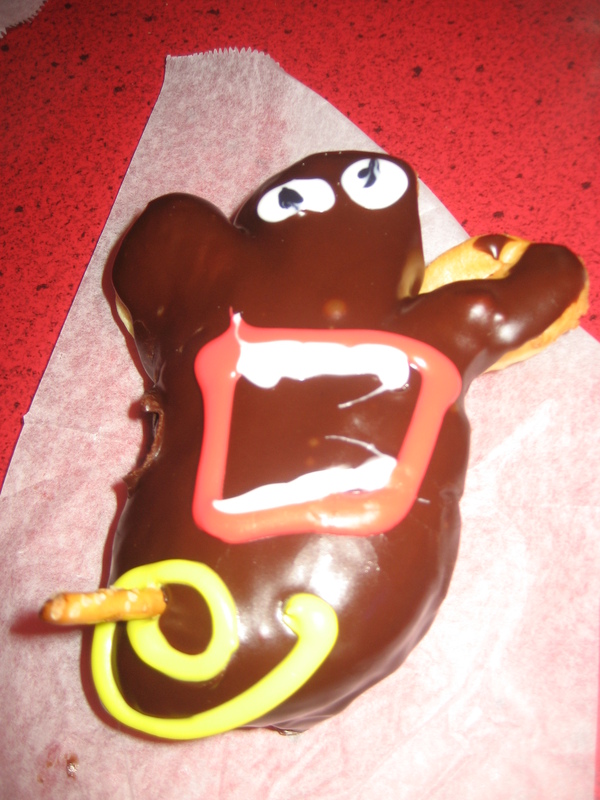 The boys chose chocolate-frosted cake doughnuts while I went for the signature voodoo doll doughnut, complete with a pretzel rod pin through the chest and red jelly filling that, like the hole, effectively addresses the concern of the underdone middle. And they’re not wrong because if we learn anything from the heroic tale of Hanson Gregory, it is that this “nothing” in the middle of the doughnut, is really quite something. So as we take a deep breath in this semi-calm we have between storms here in the US, let’s just try to remember that after the ship has been righted and the undercooked dough has been scraped off the steering wheel, great things can come from some of life’s biggest storms, even if those great things might seem at first like nothing at all. Well said! Now, if I can just ignore the ringing phone, I can enjoy this calmness. Maybe you could take a walk to your favorite doughnut store and “forget” to take your phone with you.